Engineer Your World courses are designed with flexibility in mind. 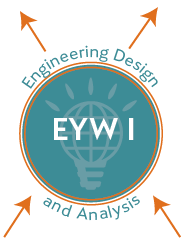 EYW I: Engineering Design & Analysis can be offered as a standalone course anywhere in an appropriate STEM or CTE pathway, or it can be combined with EYW II: Engineering Applications of Computer Science to create an introductory or capstone course sequence. We strongly recommend that students complete Algebra I before starting EYW I: Engineering Design & Analysis. Additional prerequisites may be required depending on how a school chooses to classify the course. Here are some of the ways in which partner schools use Engineer Your World courses. If you would like to discuss which approach is right for your school, please contact us. Schools seeking a more solid foundational course for an existing STEM or CTE pathway use EYW I: Engineering Design & Analysis to give students a solid foundation in engineering design and to motivate future math and science learning. or two more years of engineering design (e.g., the planned third course from Engineer Your World followed by a capstone community service project). Schools that offer EYW I: Engineering Design & Analysis as a stand-alone elective can place the course anywhere in their curriculum. This offers a unique opportunity to engage students from one or multiple grade levels in collaborative problem solving. 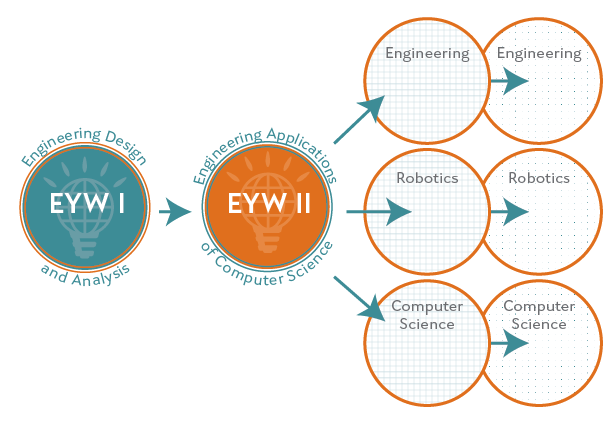 When schools offer EYW I (or EYW I and EYW II) as a capstone experience in their science or CTE sequence, students are expected to synthesize prior learning in mathematics, science, and engineering to solve the challenges in more sophisticated ways. While students in all grade levels are eligible to pursue dual enrollment credit for EYW I, upper-level students are often more prepared to dual enroll.